My Playground student Megan Goodman joins cast for the pilot ‘Haunted Hathaways’. Let’s talk about why it’s so important that The Playground Professional classes have scene work shot on camera while framed in a Close Up. First two definitions. Close-up: (CU) Camera term for a tight shot of the shoulder and face of the actor. Sub-Text: The personal thoughts of the character that the actor is thinking. In this picture you can see that the young girl playing the role of ‘Alex’ is sitting on her mark on the couch and that she is framed in a close up. She is talking to two fellow students who are playing the roles of her parents. You will also see that the other students are able to watch the entire scene on the TV monitor in the classroom. The scenario for the scene is that her parents are telling her that they are getting a divorce and the Father is moving out tonight. Every student in class that day had the opportunity to play the role of ‘Alex’. They made an entrance, hit their mark, and said their lines. However, it was the thinking and emotional responses of the actor portraying ‘Alex’ that I am looking for. In a close up, we are so tight on the actors face that if the actor is thinking thoughts that the character of ‘Alex’ would be thinking, then we will be able to see it on the monitor. These thoughts are called Sub-text. Thoughts such as: What is happening? Why is Mom crying? Did Dad just say they are getting a divorce? Where am I going to live? However, if the actor is thinking his or her own personal thoughts such as: What’s my next line? We will be able to see that on the monitor as well. 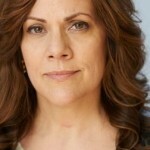 Acting isn’t just saying lines; it is when we are able to see the personal inner thoughts of the character as well. So in class, everyone get a chance to act out the role. We shoot the performances all in a tight Close-Up. Then we watched them all back. Each student got to really see ‘up close’ how his or her thoughts traveled through the camera lens. As if we could almost hear their thoughts. It’s an awesome exercise. ARTICLE: It’s the Last Day of Class. What’s Next? Excitement! Anticipation! Sheer Giddiness! Followed by jumping for joy! Screams of happiness! Hugs! However, this wasn’t caused by getting holiday presents, spreading yuletide cheer or even ringing in the New Year. 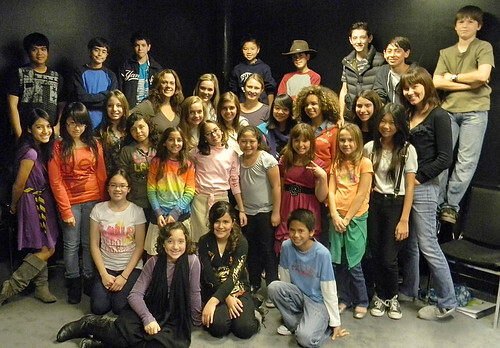 This was the atmosphere of the very last day of our Professional Preteen acting class on Saturday December 17th. The class was a combination of two preteen classes that uncharacteristically merged together. They had been in class together every Saturday for a long time, and at The Playground even longer. Today was their very last class. Over the course of the year, we literally watch these young students grow up. Coming into the Professional course is different than advanced and beginning classes. We call the course Professional because we run the classroom as close to a working professional set as possible. With four teachers, Sarah Holstrom, Danielle Hobert, Darcy Martin and myself we were able to find new ways of grouping the kids to make sure that each student was working on what they had prepared. Often breaking off into four groups so each child got much more individual working time. Over the course of a year the students have learned everything from becoming more open and free while doing improvisation to really believing they are experiencing the situation and emotions of their scene work and monologues. They memorized thousands of words. Did hundreds of tongue twisters. Some shun sunshine, do you shun sunshine? Did improvisation. Learned to focus. Learned to relax. Learned to commit before they began. They learned to ‘Breakdown’ a script and asked themselves questions like: What genre is this? What is the atmosphere? What is my Relationship with the person I am talking to? What is the Antecedent or what just happened before this? What is my Opening Emotion? What is my Intention? Reason? What is the Conflict going on? Do I have a secret? Am I lying or telling the truth? What is my Sub- Text (the stuff I’m thinking but not saying)? They learned how to listen for cues. Hit their marks. Listen to their scene partners. Take re-direction and emotional adjustments. They improved. They learned to act. And we had SO much fun learning. Along the way many students got agents. A dozen booked commercials. And every single one found friends for life. Junior Varsity/Varsity – Due to the demand to continue classes here at The Playground we created both a Junior Varsity and Varsity Acting classes (which I will teach). Junior Varsity combines both preteen and children graduates and Varsity is for teens, fourteen and over, who have finished the two year program. Both classes focus on audition techniques, more complex and harder emotional challenges, more layered comedy techniques, harder scripts, longer memorization, more advanced skills. Matthew Kramer, a Tom Sawyer-esque preteen with energy to spare just instant messaged me on my Facebook page as I was writing this. I’m writing an article for the website about the class you were just in. Want to have a quote in it? What is something that you learned? Loved? or thought was going to be easy but was much more difficult? What will you miss? I will miss ALL my teacher’s! But mostly my favorite teacher of all Gayla because she is SO nice and made acting class really easy for me! Ah thanks. But HOW or WHY did I make it easy for you? How did you learn stuff from me? I learned from you because I payed attention. And you made it easy for me because you Urn treated me nice and didn’t make me feel embaressed in front of the whole class! After this eschange he proceeded to tell me that twenty minutes earlier he and his Father were in a car accident where their car spun around seven times. However, even though he was shaken up, he had noticed I was online and had just wanted to say “hi” because he missed class so much. The he wanted to know when his Dad could call me about joining Junior Varsity. I’m going to really miss this wonderful group of kids. After each class ends I always ask myself the same question. What did I learn from them? For me as a teacher? I learned that every single student dreams of doing their best work when they come into class. Even if they don’t, they do want to. Teaching them to be free enough to at least try to do their best work is more important then if they did. The details are all kind of secret but my student and private client Sari Arambulo is shooting the staring role in a new Untitled Nick Pilot. I’ll update you when I can!! !